The FUN way to do ear training. Direct Application Ear Training are recommended for students with above 50% skills with one note ear training. There are many different products you can buy that vary in difficulty. The list below gives a recommend order for the “Direct Application” listening courses. You can work on more than one of these courses at the same time. Think of these courses as listening to music and doing ear training at the same time. You probably want to have many tracks to listen to so that you don’t get bored with the same track over and over. Some of these courses also have a singing component in the course but in general you should listen to the tracks in these various courses to help pinpoint where you are having issues with your comprehension. For instance you many have a problem with minor keys or a certain mode. Once you have pinpointed these problems contact Bruce so that he can give you recommendation on how to fix your issues quickly. Here is a breakdown and recommended order for the Direct Application Ear Training Listening Courses: Click on title to go directly to book. Having around 50% right notes with the “one note” exercise found in these books would help you be more productive with the Direct Application Ear Training. Pure Country Ear Training is often recommended as the first “Direct Application” ear training courses. You should work on this course when you are getting around 50% correct notes with the Ear Training One Note Complete course. Pure Country Ear Training gives you Country Music Grooves that serve multiple purposes. The first is to create a simple enough real music situation wherein a beginning ear training student can learn “One Note” Ear Training. The second is to create a real music situation that sounds pleasing and within the chosen style. The third is to create music tracks that are in common key centers like Major, Dorian, Lydian, Mixolydian, Aeolian with Phrygian and Locrian added, for a complete picture of the modes of a Major Scale. Fourth is to create an ear training exercise wherein a student can also play along, thus additionally developing improvisational skills. Please check out the example MP3s to see if you agree that this course meets those requirements. By far the biggest problem I run into with students is their inability to hear in key centers that are anything other than simple triadic based situations. Obviously most music does not fit into this narrow window so an ear training student needs to work on ear training within more varied musical settings. But these settings need to be simple enough to be encouraging. By listening to the MP3 examples below I think you will agree that a nice balance has been achieved by making backing tracks that are simple yet musically rewarding to listen to. By then placing a “One Note” ear training environment over these tracks you give a student a situation where they can develop their ear training skills in a simple yet musical setting. I realized a long time ago that just doing ear training exercises that involve a stark non musical exercise will not necessarily lead to being able to apply it in a real-time music situation. If you are currently working on one of muse-eek.com’s courses that can be described as a “non-musical exercise” or using other exercises on or off the internet, you need to realize that non-musical exercises, while helpful, are not the final answer to your ear training journey. YOU NEED DIRECT APPLICATION of your learning to real music. Examples of MP3s Found in the Pure Country Ear Training Course. 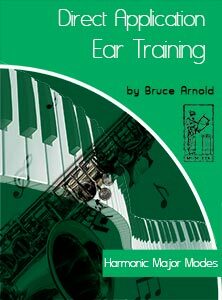 A small PDF is also included to explain this type of Contextual Based Ear Training if you are unfamiliar with this type of ear training. Below are 7 excerpts from the 84 tracks found in this Direct Application Ear Training course. This 10 track CD download in MP3 format is part of a series of additional audio files that give a student more experience applying their contextual ear training skills to real music situations. These tracks are full band excerpts using music styles as diverse a classical symphony orchestra pieces to down home Bluegrass tracks. All music is in various Major key centers. While you listen to the track you will hear one note played followed by the name of that note. This will help you to apply one note contextual ear training to a real music situation. Play along or just listen either way these tracks make ear training fun. This Direct Application series is also an enjoyable way to do ear training. You can play along with your instrument or just listen passively; whichever works best for you. You can jam along with the tracks as you are tested on various notes or use it as a way to study scales, arpeggios and many other musical elements while you are also being tested with ear training exercises. For the student with limited practice time this is ideal for getting the most out of your schedule. There are 10 tracks each exploring different styles of music in various Major key centers. An informed ear is the the essence of making music. This is one of the reasons why we have developed so many different kinds of ear training products. These various exercises, set up for different contexts, will prepare you for any musical situation. The Direct Application Ear Training series gives you yet another step and in a way, the final step to apply your skills directly to real music. Direct Application is recommended for any student who understands the difference between “contextual ear training” and “interval ear training.” While having some experience with our One Note Series, Fanatic’s Guide or Contextual Ear Training books is recommended, it is not essential to reaping the benefits of the exercises. But keep in mind that context is the secret behind all great ear training skills. The more you vary the type of exercise you do, the more you will be able to apply this ear training to the multitude of situations that will come your way in your musical life. 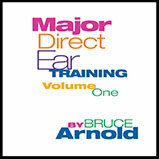 Get Direct Application Ear Training CD Volume One Major download today! This 10 track CD download in MP3 format is part of a series of additional audio files that give a student more experience applying their contextual ear training skills to real music situations. These tracks are full band excerpts using music styles as diverse a classical symphony orchestra pieces to down home Bluegrass tracks. All music is in various Dorian key centers. While you listen to the track you will hear one note played followed by the name of that note. This will help you to apply one note contextual ear training to a real music situation. This Ear Training is FUN. You can play along with your instrument or just listen passively. This Direct Application series is also an enjoyable way to do ear training. You can play along with your instrument or just listen passively; whichever works best for you. You can jam along with the tracks as you are tested on various notes or use it as a way to study scales, arpeggios and many other musical elements while you are also being tested with ear training exercises. For the student with limited practice time this is ideal for getting the most out of your schedule. There are 10 tracks each exploring different styles of music in various Dorian key centers. Direct Application Ear Training is recommended for any student who understands the difference between “contextual ear training” and “interval ear training.” While having some experience with our One Note Series, Fanatic’s Guide or Contextual Ear Training books is recommended, it is not essential to reaping the benefits of the exercises. But keep in mind that context is the secret behind all great ear training skills. The more you vary the type of exercise you do, the more you will be able to apply this ear training to the multitude of situations that will come your way in your musical life. 10 MP3s in a Dorian Key Center using various styles such as Rock, Funk and Reggae. 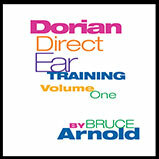 Get Direct Application Ear Training CD Volume Two Dorian download today! 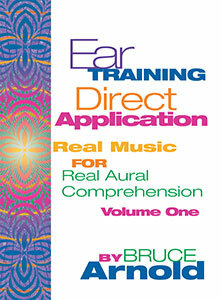 The Direct Application Ear Training series is a major expansion of our ear training method. It bridges the gap between ear training in a controlled exercise environment to its application in the real world. This is the first course of its kind for students who often experience the frustration of not being able to apply what they have learned from an aural comprehension exercise to a playing, real time situation. Each volume in this series covers a particular kind of key center and for the first time shows not only how they can be built, but also explains why certain key centers can be difficult for students to hear. Have fun listening a playing along with Direct Application Ear Training Exercises. This Direct Application series is also an enjoyable way to do ear training. You can play along with your instrument or just listen passively; whichever works best for you. You can jam along with the tracks as you are tested on various notes or use it as a way to study scales, arpeggios and many other musical elements while you are also being tested with ear training exercises. For the student with limited practice time this is ideal for getting the most out of your schedule. There are six tracks in all 12 keys with each volume, so you get 72 tracks to get you developing your skills. These tracks are graduated in difficulty so that you can build your prowess over time, at your own pace, and in a sensible manner. Do Ear Training in different contexts will prepare you for any musical situation. An informed ear is the essence of making music. This is one of the reasons why we have developed so many different kinds of ear training products. These various exercises, set up for different contexts, will prepare you for any musical situation. The Direct Application Ear Training series gives you yet another step and in a way, the final step to apply your skills directly to real music. Direct Application is recommended for any student who understands the difference between “contextual ear training” and “interval ear training.” Keep in mind that context is the secret behind all great ear training skills. The more you vary the type of exercise you do, the more you will be able to apply this ear training to the multitude of situations that will come your way in your musical life. Get Direct Application Ear Training download today! 16 pages: Physical book contains on CD and Digital Book contains 72 MP3s. 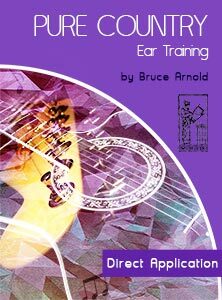 The Direct Application Ear Training course is the first step in understanding how contextual ear training and chord/scale relationships intersect. This course is really a primer course for the Scale Analysis book which applies contextual ear training to 36 chord progressions showing you how to hear the entire progression in one key center. 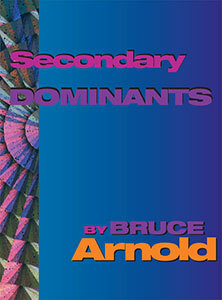 “Secondary Dominants” course on the other hand just deals with the Melodic Minor Ascending Modes and how these modes relate to secondary dominants when hearing the entire chord progressions in one key center. These exercises help a student learn how they hear secondary dominants and in turn develop an ability to improvise over these chords and recognize their existence via their aural skills. If you have ever wondered how to truly get the most out of the Melodic Minor Ascending Modes then this book will be a total transformation for you. Ear Training is learned in one context at a time. If you spend your time just doing one certain exercise you will find while you gain ability with that specific exercise, you may not be able apply it to “real” music situations. This is why applying ear training to common chord progressions is one of the most important things to do once you have a working knowledge of how all 12 notes sound within a key center. This book contains simple singing and improvisational workouts over chordal jam tracks to put yourself inside these “real” musical situations. They are a fun way to strengthen and test what you are learning. Knowing and hearing Secondary Dominant Harmony is key to understanding modern music. Secondary dominant harmony is one of the most commonly found chordal movements in music; “I Got Rhythm” wouldn’t exist without it! Being able to hear these chords and how they interact is crucial to playing and writing music. Secondary Dominant harmony chord scales are most commonly associated with the modes of Melodic Minor Ascending. That’s why this book concentrates on these 7 modes of Melodic Minor Ascending. Develop the ability to use “your” ear to make musical decisions. Developing your ability to instantly recognize what you are hearing in any given chord change is an important skill for any improvising musician or budding composer. 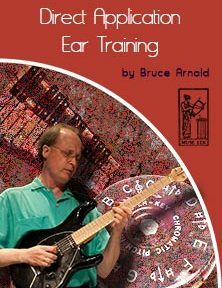 This book presents you with chord progressions specifically chosen from my 30 years of teaching ear training because they are likely be heard in one way. This of course won’t be universal with all students, but in my experience I have found that the progressions I have provided tend to lead a student’s ear in a certain direction. Above all, first use “your” ear to help you decide which scale to use and then tackle these chords progressions accordingly. 91 page book and 1 CD or 84 MP3s with digital versions. Tracks use various styles such as Rock, Funk and Reggae. The MP3s allow you to work on this exercise in all 12 keys. Seven MP3 solos examples are also included. 91 pages: Digital Book contains 84 MP3s. Simple no fancy stuff. That’s the way I like my ear training and my music in general. Thanks Bruce for digging out the country roots inside of you! E. Svolet. This entry was posted in Ear Training and tagged Direct Application Ear Training by Muse Eek. Bookmark the permalink.